Updated April 22, 2019 - Both the Federal Reserve and ECB clearly signal we shall see NO further interest rate hikes....and that will print more money later in 2019. The banking world is DOOMED! There are many people out there who are working on payment systems and delivery systems that could turn the banking world on its head much like UBER has done to taxis, EXPEDIA has done to travel and AIRBNB/BOOKING.com have done to hotels. Banking in its current form is not capitalism. It is fraud and crony capitalism, kept afloat by ever-more desperate government interventions. It should be dismantled. Under a system of 100 percent reserves, loan banks (100 percent equity-financed investment trusts) would be like any other business and would not need any more regulation than that of the makers of potato chips. Dec 27: This is a BREAKOUT & Positive Backtest!...the breakout signals Higher Interest Rates are coming SOON. Feb 14: techn. speaking, bank shares are ready to initiate fresh upleg. Dec 23 - Feb 26, 2018 : a BREAKOUT or a Canary in the Mine for HIGHER INTEREST RATES. June 8 - July 10: Topping out? Oct 22 - Nov 16: Index fallen out of a BEARISH Triangle = STOP LOSS! April 22: lower we shall go. Stop loss = Sell The End! * the performance of AIT (Aetna Life) is the consequence of the manipulation of the Bond market (municipal and Treasuries) by the FED = extremely dangerous. note: above charts are somewhat different because of the Dollar/Euro fluctuation but clearly sent their message! Important: there is a HUGE difference between COMMERCIAL BANKS and 100% RESERVE INVESTMENT BANKS like Euro Pacific. Under normal conditions, the profit figures of Banks improve when Interest Rates rise. This time however the situation is different: 1. there is NO ROOM for higher interest rates and 2. the value of the High Order Capital Goods (Real Estate in particular) will continue to suffer...and this will severely impact the balance sheets of the Banks and Financials. European Banks (and this includes the SWISS BANKS) are in a worst shape, next come the US-Banks. Houston, we have a problem: Deutsche Bank is virtually BANKRUPT and too Big to Bail-out or to Bail-in! Stress Tests don't mean NOTHING! ...smoke curtains they are. Canadian banks were in a better shape...that was until May 2017: Sell Canadian bank stocks. This is another no-brainer. If housing prices in Toronto tank, a wave of foreclosures could rip across Canada. Banks and other lenders would take huge losses if this happens. Panamanian Banks are even better. Banks in Panama must by law keep a min. of 30% reserve ratio. Accounts with Designated Banks in the America's are covered by Government up to $ 1 million. The Bank index in Gold (click to enlarge) note that on the PF chart below , the index is running into SEVERE RESISTANCE...but has broken out !!! Higher Interest Rates will hopefully push the sector back into the PROFIT ZONE. Technically spreaking one should STAY AWAY. The situation of the Bank sector is A LOT WORSE than what is openly admitted. Banks in the EU are extremely (1:24) under capitalized! There is NO WAY authorities will risk the bankruptcy of more banks. They will continue to bail out ALL and this will continue until Hyperinflation hits. However only ONE unexpected accident can wipe the banking system overnight. Expect riots and civil War if an accident does happen. The LONG TERM trend doesn't look good. Why take the risk to invest in Financials???? There are better and SAFER investment instruments. There is NO WAY you can trust the financials as they are real masters in cheating on the investor. The credit markets are medicated by direct involvement of the Central Banks and the balance sheet of the FED looks like a levered junk bond fund. Authorities will rather risk Hyperinflation and Nationalize than let banks go bankrupt. Bank shares in the EU and Switzerland: Amazing is to see people still trust Banks and even still buy Bank shares and (even worse) Bonds issued by Banks!? Having said this, Banks won't go insolvent as long as Governments are solvent. For this reason the overall situation is even more dangerous. The Bitcoin Investment Trust (BIT) enables investors to gain exposure to the price movement of bitcoin through a traditional investment vehicle, without the challenges of buying, storing, and safekeeping bitcoins. GBTC is the publicly quoted symbol for shares of the BIT, “an open-ended trust that is invested exclusively in bitcoin,” and sponsored by Grayscale Investments. The Trust was formed late in 2013, and qualified for public trading on the OTCQX market early in 2015. GBTC has been gradually increasing in price over the last couple of months, and much quicker than the underlying bitcoin. Last week, the daily GBTC over bitcoin premium averaged over 60%. The IMF expects that Spanish and Italian banks will lose $300 billion just on their loans to companies in the next 2 years. If we add to that property loans and personal credit, it will reach into the trillions of dollars. The Eurozone banks are working with a staggering avearge 26-times leverage, which guarantees they are completely insolvent. The eurozone banks need another $1 trillion just to meet the stress test. With the eurozone banks insolvent, it means that the ECB, as well as the eurozone governments, are also insolvent. The Volker Rule can be compared to the Glass-Seagall Act: trading restrictions are placed on financial institutions. The Volcker rule separates investment banking, private equity and proprietary trading (hedge fund) sections of financial institutions from their consumer lending arms. Banks are not allowed to simultaneously enter into an advisory and creditor role with clients, such as with private equity firms. The Volcker rule aims to minimize conflicts of interest between banks and their clients through separating the various types of business practices financial institutions engage in. The Volcker rule goes in April 1st, 2014. The Volcker Rule will cost U.S. national banks as much as $4.3 billion to implement as it forces them to sell restricted investments at a loss, according to a study by the Office of the Comptroller of the Currency. The regulator estimates implementation costs between $413 million and $4.3 billion for banks it supervises, the OCC said in a report released yesterday. Most of the potential costs could come from the rule’s curbs on certain investments, such as in some collateralized loan obligations. The agency also said affected banks will mostly be those with more than $10 billion in assets and could include as many as seven community banks. The Volcker Rule, which bans banks from making speculative trades with their own money and limits their stakes in certain private funds, was adopted Dec. 10 by five U.S. financial regulators. The rule, named for former Fed Chairman Paul Volcker, imposed the restrictions in response to the 2008 credit crisis. Banks in Panama MUST by law have a reserve coefficient of at least 30% . The Deutsche Bank, is on the verge of collapse because the value of the derivative-position of the bank exceeds the value of the total world economy! Deutsche Bank carries $ 72 trillion derivatives on its books, while the world economy is $ 66trillion. Governments force/blackmail pension funds, insurance co's and banks to absorb a maximum of Treasuries : Japan, USA, France, Belgium, The Netherlands.. The CYPRUS DEAL tells it all...STAY AWAY. Financials, and this includes Insurance co's are DOOMED!What's more, the authoities are liying to us: at the time Greece ran into problems, it was known that there were repercussions for Cyprus. Why than took it over a year before the Cyprus problems surfaced? In the EU-zone there are NO MINIMUM's fo the Bail-in amounts: if an accident happens, you can loose ALL your deposits with the bank. Trusting your money to the banks is like trusting your life to the Devil. We have insolvent banks supporting insolvent sovereigns and insolvent sovereigns supporting insolvent banks. Most large banks are simply not solvent if there are major sovereign defaults. The US banks have sold some $90 billion in credit default swaps on Greek, Irish, and Portuguese debt to European banks. That is supposedly balanced with other purchases of CDS, but much of that insurance is from German banks. A firewall will do nothing more but delay the Apocalypse because it is built with Fiat Paper money which is decreasing in value and power. The financial problems have a direct impact on the dangerous structure of CDO's (derivatives, structured products,...) which brought Greece down in the first place and on the Financial markets: stocks, commodities, bonds! Banning Shorters only makes matters worse. This continues to be the tale of a dangerous adventure. Banks are bankrupt and they will rot to the core! There is no way to keep bailing them out without risking HYPERINFLATION and there is not even a plan to mop up all the extra QE...It will take Hyperinflation before the herd SEES that the Emperor has no clothes. An unique aspect of Banking systems is that they cannot be rebuilt once they turn insolvent. They rot in place and nothing can be resuscitated except for the balance sheets. Not even the higher capital requirements required by the Basel III regulations can solve this problem. The Basel agreement gives banks 9 years to comply with a 7% reserve level, practically nullifying the exercise. One has to be a fool (or a Hedge fund manager) even to consider buying Bank shares. Fractional Reserve Banking is nothing more than Premeditated Theft and Usury [usury is charging an interest rate which cannot possibly be honored]. Charts are issuing warnings all the time. Stay away from Bank and Financials: it is probably safer to travel to Las Vegas and use your funds to play the Roulette than to speculate on Bank and Financial Equities. So many banks have been closed down (+ 120 from Jan to Sep. 2010 and so many will follow) that the FDIC has run out of funds! Increased capital requirements are still insufficient and Financials remain dangerous as long as we have Fractional reserve banking and creation of fiat money out of thin air. The FDIC lost $ 25 bn and last June (2010) it was in the hole for $ 10bn. 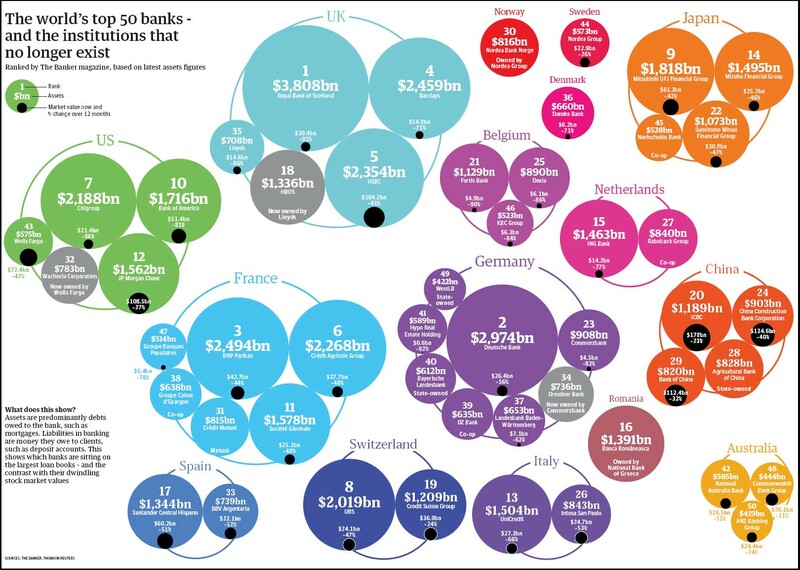 The exposure of the major banks to Derivatives is scary. Derivatives are a nuclear financial bomb and Interest Rates are the detonator. The crisis in Greece is not so much about Greece, which is irrelevant in the greater scheme of things (at 2% of the EU economy). It is about the German, French and British banks and the consequences if Greece defaults, followed by Ireland, Italy, Portugal and Spain (the infamous PIIGS). These countries will default on their sovereign debt; it's just a question of when. Creditors worldwide had a combined direct exposure to the PIIGS of almost $2.4 trillion, according to the Bank for International Settlements, as at Dec 31, 2010. (The total profits of all the EU banks for the six months ended June 2010 were just €46.8 billion while total equity was €1.8 trillion, according to European Central Bank data). If you consolidate 45 bankrupt Spanish banks, the end result still remains a bankrupt entity! In any event, there is widespread agreement that the regional Spanish banks, the cajas, are bankrupt, as they made massive loans for construction and mortgages. The government has taken some action, forcing 45 caja savings banks that were threatened by bankruptcy due to bad property loans to consolidate down to 14. But although bank regulators have estimated that Spanish banks will need €26 billion in extra capital, many skeptics believe this severely underestimates future losses and that the government may have to step in with a much larger bailout for the financial sector. The Bank of Spain contends that construction debt to banks stands at some €400 billion, of which repayment of €176 billion is questionable, with €31.6 billion of those considered nonperforming. (WSJ). Replace the word FED by the word ECB for Europe in the following video clip: this excellent video is short but to the point. It is a very good explanation of why there is no way out of QE. POMO is primarily to bail the banks out of bad mortgage paper that they have written up in value to outrageous levels and not audible to sustain thanks to FASB. It is a way of hiding that outrageous paper trick that makes the financial balance sheets look good as FASB allowed the financial industry to decide for themselves what crap derivative paper is worth. This is the financial equivalent of the mafia burning down the restaurant used to launder money before the IRS saw there were no clients. This is the equivalent of the auditors shredding the trades at Enron before anyone could audit them. This is the truth.